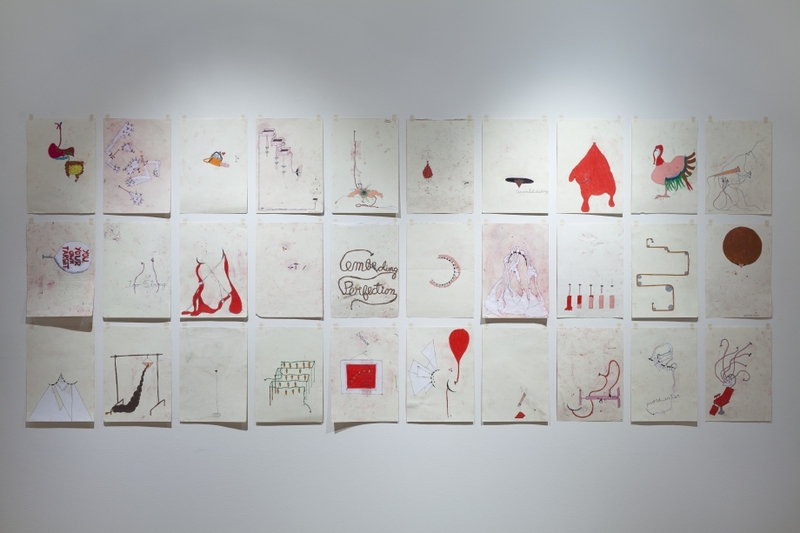 Steve Turner Contemporary is pleased to present This is a Wound, Not Just the Drawing of a Hole, a debut solo exhibition by Medellín-based artist Camilo Restrepo for which the artist has created scores of drawings that represent violence on a global, local (Colombia) and personal level. 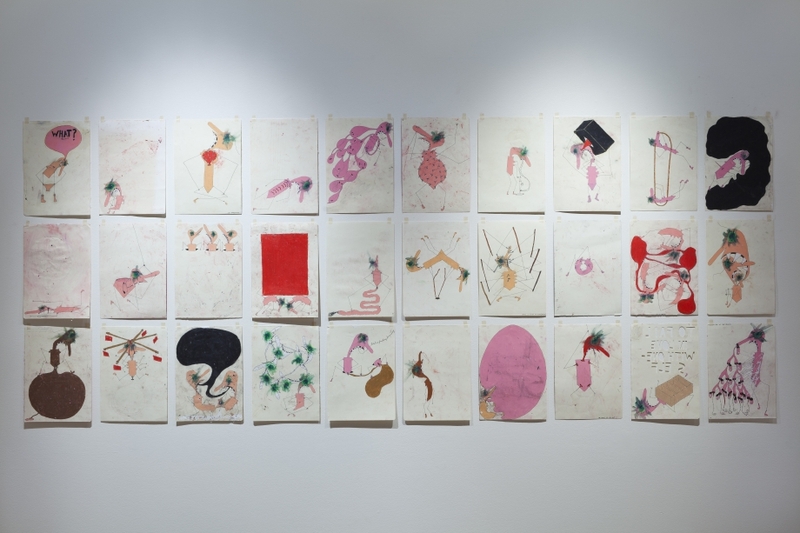 Restrepo will present three bodies of drawings: MisAmerica; A Land Reform and Bodies Of Evidence, all which represent a form of violence that we all launch against ourselves and against others. Some of Restrepo’s imagery is aimed at the absurdity of the War on Drugs and its disastrous consequences in Colombia. 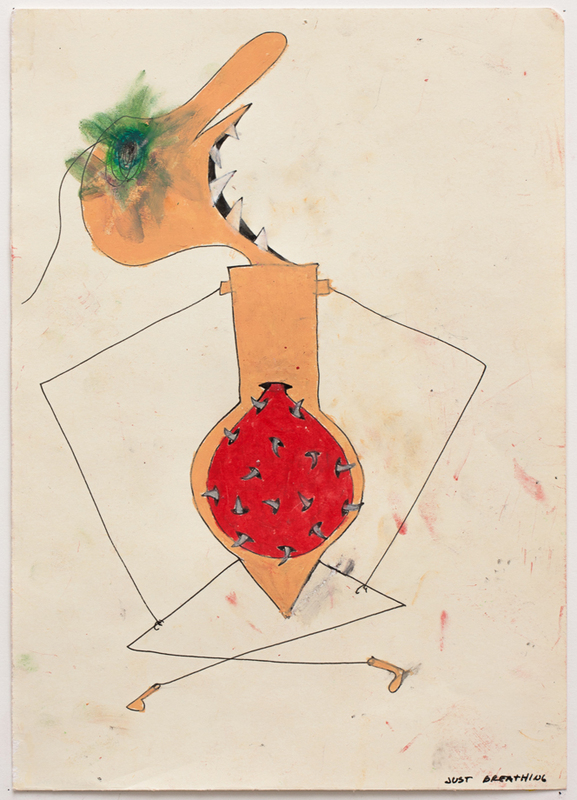 Other works are inspired by the artist’s personal war on himself, on his previous desires to destroy his flaws and attain perfection. 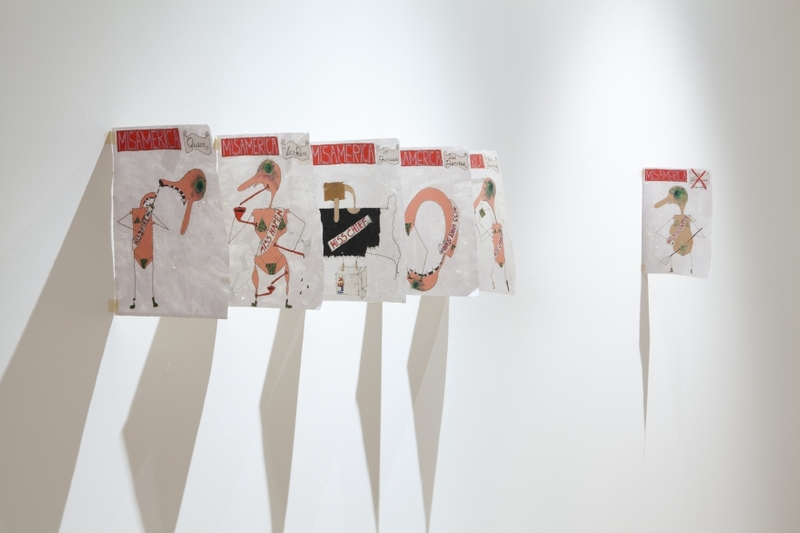 Restrepo’s drawing practice has elements that make it akin to sculpture. 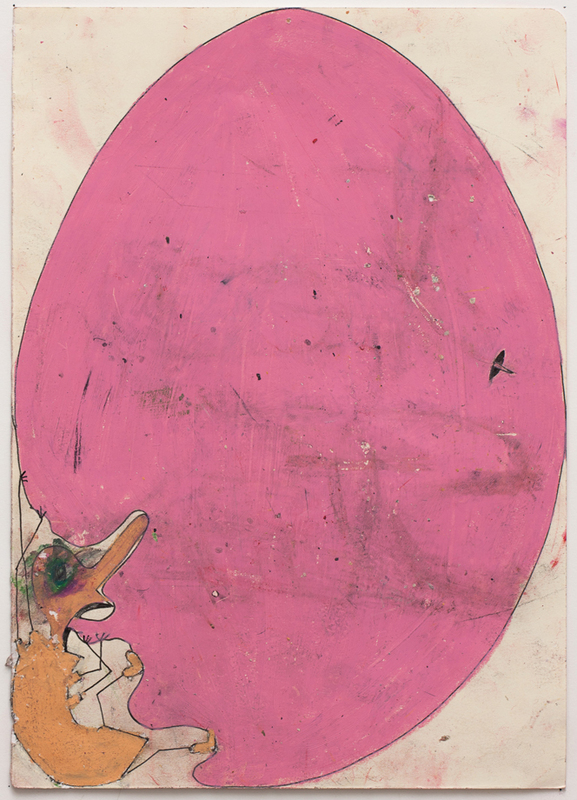 He scratches, scrapes and cuts into the paper to highlight its materiality. He does not aim for clean surfaces. His hand smears what he has already drawn, and as the drawings are double-sided, they absorb the pigments of previous drawings that left residue on his desk. They are made with black ink and with a narrow array of colors from water-soluble wax pastels. 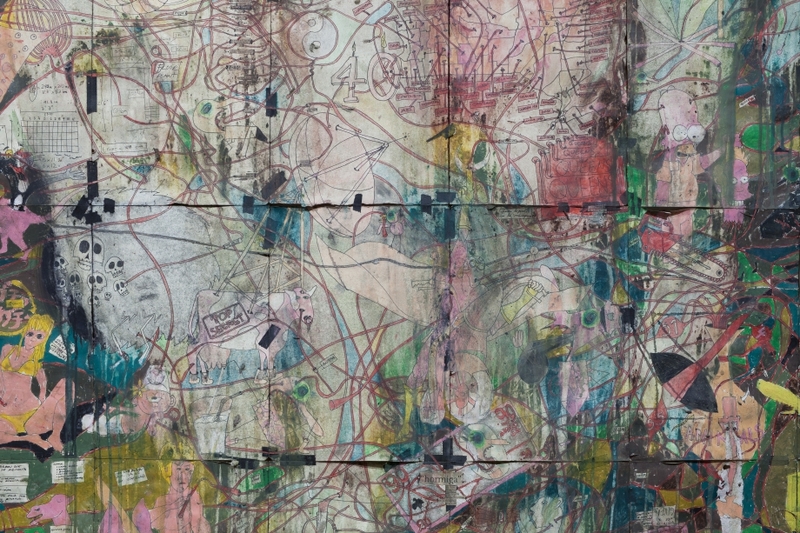 Restrepo uses his saliva to dissolve the pastels and he links the two sides of the sheet by drawing black holes on either side. He erases with a precision knife leaving scars and wounds that remain visible. 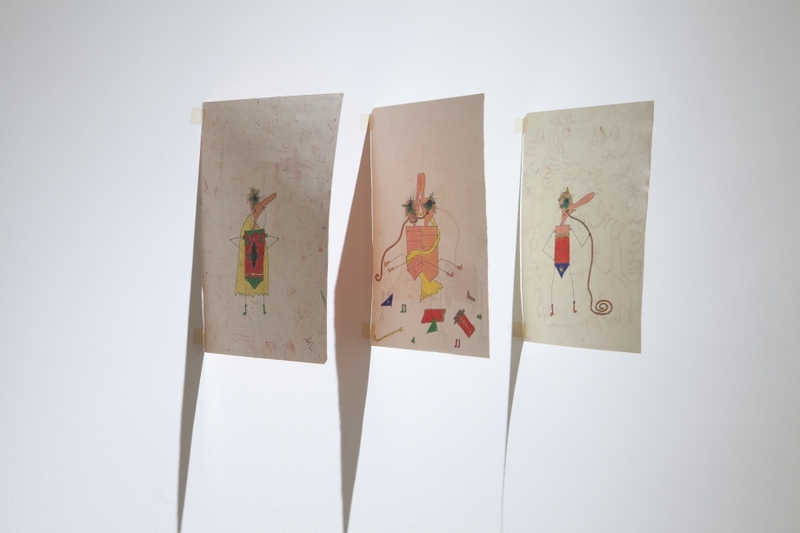 The sheets are torn from a sketchbook, and when they comprise a larger work, they are taped together. This enables the drawing to be folded and carried by the artist wherever it needs to go. Aside from the practical convenience, this act adds content to the drawings and also serves to create a record of the transportation itself. 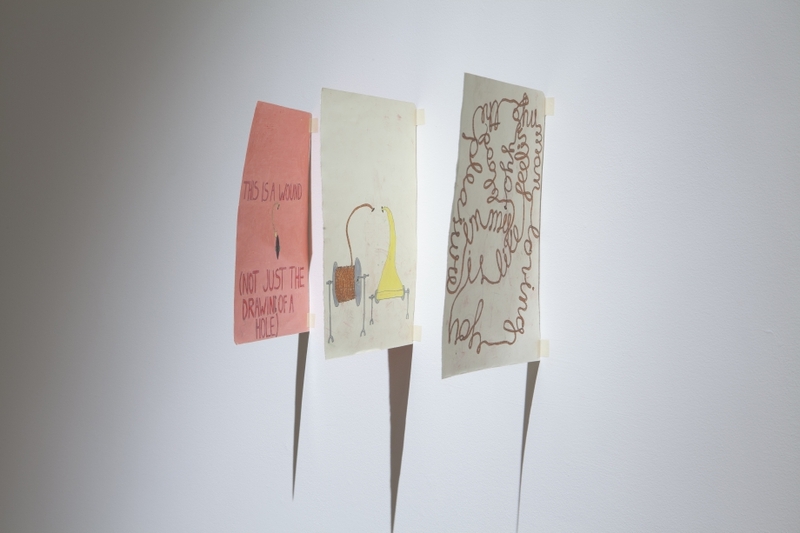 MisAmerica consists of six drawings that will be installed perpendicularly to the wall, as though the wall is the spine of a book and the drawings are its pages. The sheets will flutter when viewers walk by, and over time, they will droop toward the floor from their own weight. Viewers are permitted to touch and to turn the pages, and in so doing, they will add marks that record the act of viewing. The title suggests alternative meanings referring to the beauty contest, to Mi S America or My South America, or a negation of America. 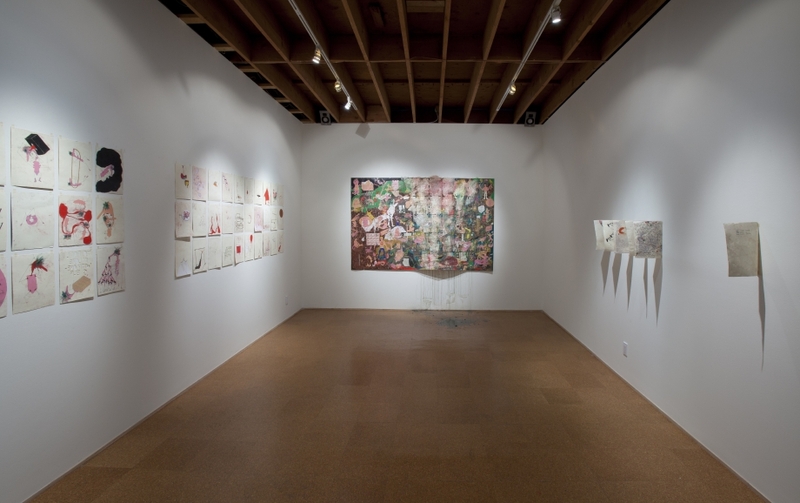 The content of the drawings addresses the severe collateral damage caused by the United States’ war on drugs and terrorism. A Land Reform is a large drawing consisting of multiple smaller drawings that are taped together. It is based on the aliases of members of narco cartels, crime organizations and guerrilla and paramilitary groups members that frequently appear in the newspapers and which Restrepo has been clipping and saving for several years. 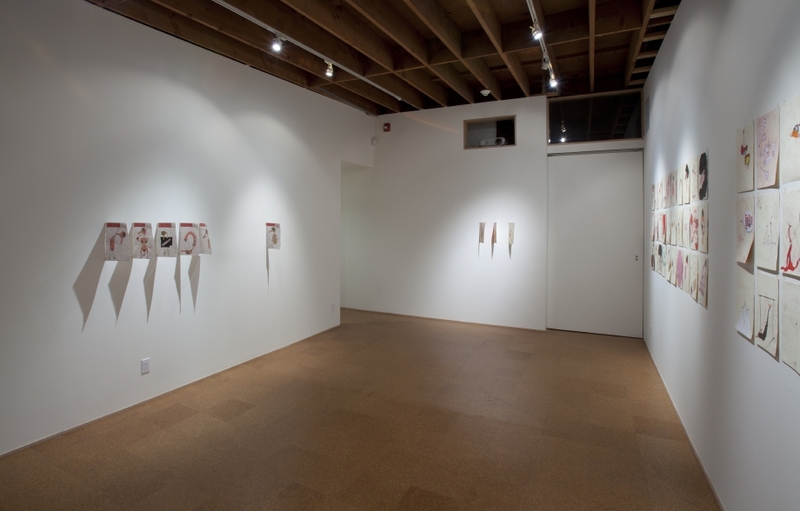 The aliases are classified by types-things, animals, places, television characters, famous people, commercial brands, foods, letters, numbers, etc., and the artist has created a visual translation of each with a red hose connecting the newspaper text to its image. 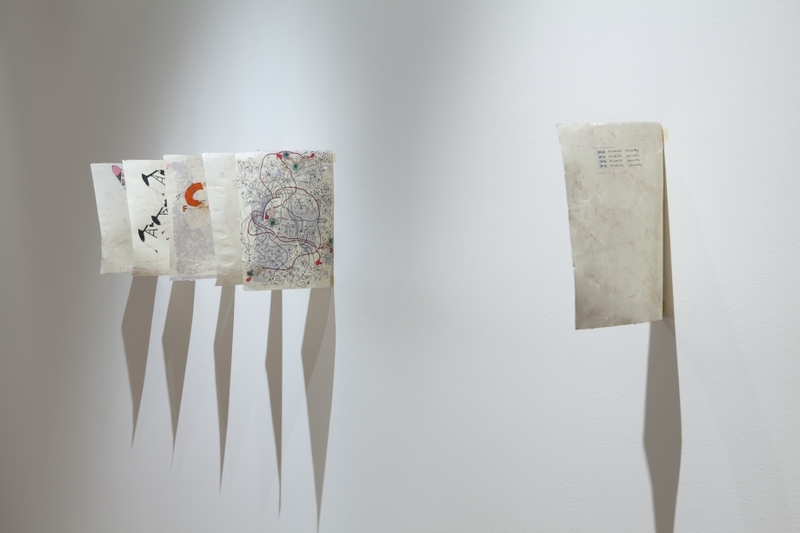 All the hoses pass through drawings of black holes to connect to the other side of the paper creating a complex circulatory system that allude to the intricacy of the armed conflict in Colombia. 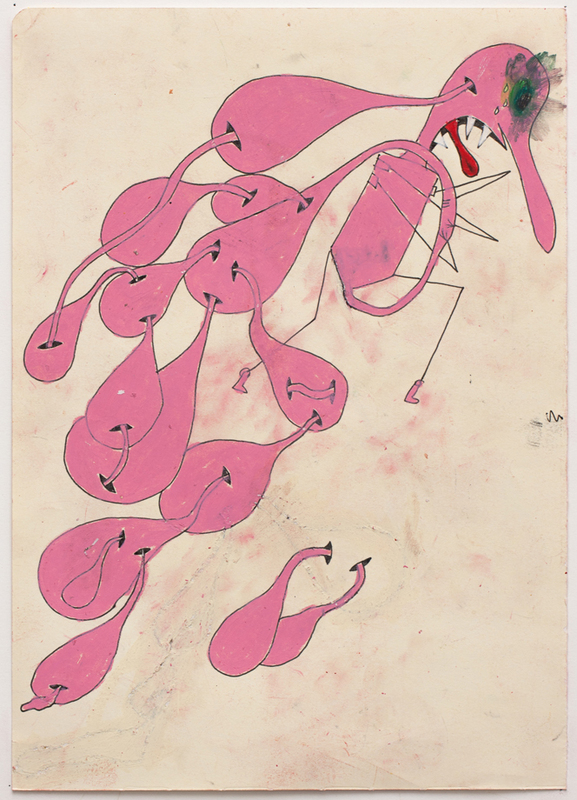 Bodies Of Evidence consists of sixty drawings whose main character is a generic, gender-neutral piece of pink meat with teeth and holes, sticks for limbs and exploding eyes. 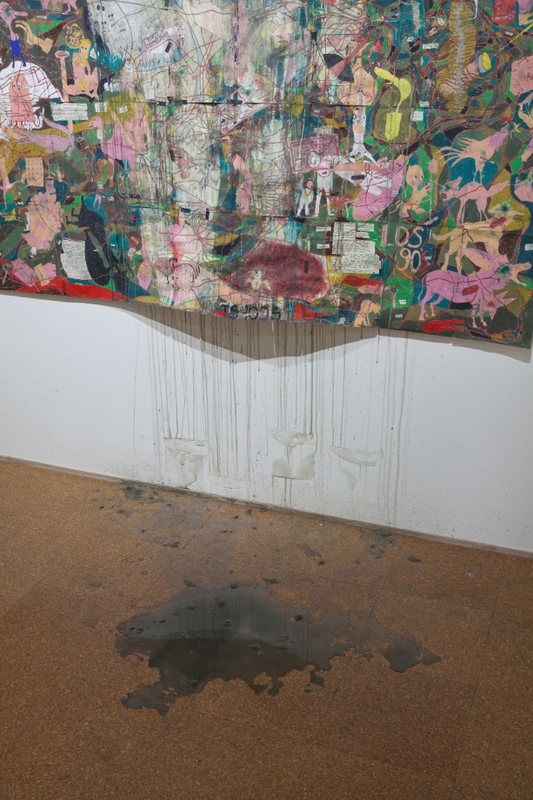 It is mostly engaged in one form of aggressive behavior or another and it represents the internal psychic war that the artist faces every day, and at the same time, through humor and absurdity, the dismantling of that war. Camilo Restrepo (born 1973, Medellín, Colombia), earned an MFA from CalArts (2013) and a masters degree in aesthetics from the National University of Colombia (2008). 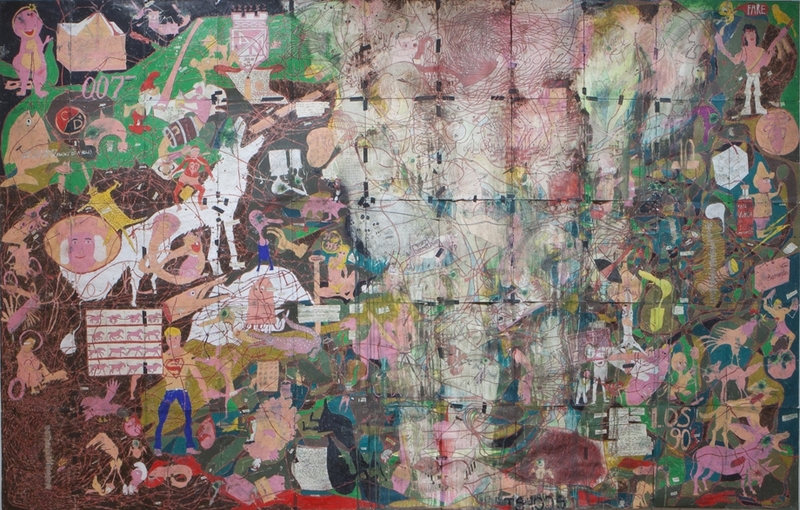 He has had solo exhibitions at Galería Santa Fe, Bogotá (2011); Casa Tres Patios, Medellín (2010); Galería de la Oficina, Medellín (2010) and LA Galería, Bogotá (2009). This is a Wound, Not Just the Drawing of a Hole is the artist’s first solo exhibition with Steve Turner. Camilo Restrepo (born 1973, Medellín, Colombia), earned an MFA from CalArts (2013) and a masters degree in aesthetics from the National University of Colombia (2008). 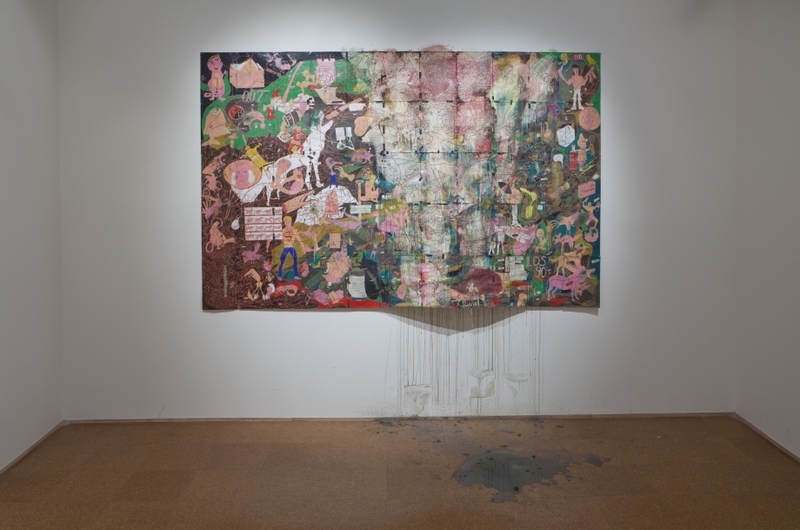 He has had solo exhibitions at Galería Santa Fe, Bogotá (2011); Casa Tres Patios, Medellín (2010); Galería de la Oficina, Medellín (2010) and LA Galería, Bogotá (2009). In 2010, Restrepo was nominated for the Premio Luis Caballero, the most important prize in Colombia for artists over 35.